At Rompa, we want to give back to society. That is why we support Goodwill, a Dutch organisation that tries to brighten the lives of children. Every month, Goodwill hosts days out for children who are in medical daycare facilities, to take their minds off their condition for a while. Medical daycare facilities are there for sick children and children with (e.g.) a development gap. The government does not provide a lot of money for little luxuries, even though these children need that so badly. For 25 years now, Goodwill has therefore been hosting its Goodwill Days with the help of businesses that want to support this cause. The activities range from a day out to the zoo, a theme park or a swimming pool to story time with ambassador Gerda Havertong. Besides days out, Goodwill also provides useful play equipment and toys for the medical daycare facilities, including such things as balance bikes, a roller slide and a tactile box. In addition, the organisation sets up cuddle areas and places to play dressing up games. 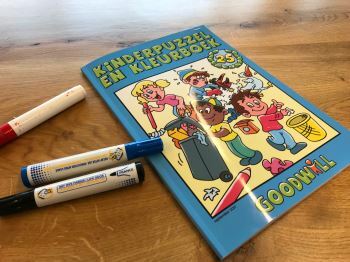 Every month, Goodwill releases a puzzle for children and a colouring book with a special theme and sends free copies to all affiliated daycare facilities. With our contribution, we hope to brighten the days of children in medical daycare facilities. If you would like to know more, be sure to take a look at Goodwill’s website.